The ECS, responsible for regulating an array of physiological processes that are instrumental in maintaining health, was discovered less than 30 years ago. While there’s evidence that cannabinoids have been used for their medicinal properties since the Stone Age, it wasn’t until the mid-1990s that scientists began to understand how they encourage healing and homeostasis. The endogenous cannabinoid system—named for the plant that led to its discovery—is one of the most important physiologic systems involved in establishing and maintaining human health. Endocannabinoids and their receptors are found throughout the body. The endocannabinoid, short for “endogenous cannabinoid” or ECS system is a chemical communication system with the goal of maintaining homeostasis. In simple terms, this particular system is responsible for helping our cells obtain and maintain optimal health by keeping them stable. Homeostasis keeps the internal environment stable, regardless of how the external environment fluctuates. Cannabinoids, such as CBD (cannabidiol) found in the cannabis plant, help to maintain a homeostatic balance at every level of biological life. This includes our collective human relationship with the external environment. Since the ECS plays a role in neurogenesis (new brain-cell growth), the plasticity of our brain is influenced by the promotion of humor, creativity, open-mindedness and the ability to grow past limiting behavior patterns. Chronic stress weakens and damages the normal function of the ECS. To stimulate the natural release of cannabinoids (which your body already produces), you can participate in mind-body practices. An easy way to stimulate the ECS is through cannabimimetics (cannabinoids from plants, such as CBD) in the form of CBD Oil Drops. Are humans the only type of life that has an ECS? Cannabinoid receptors are common in both animals and humans, mammals, birds, fish and reptiles, all have an endocannabinoid system that requires proper levels of cannabinoids to function properly. 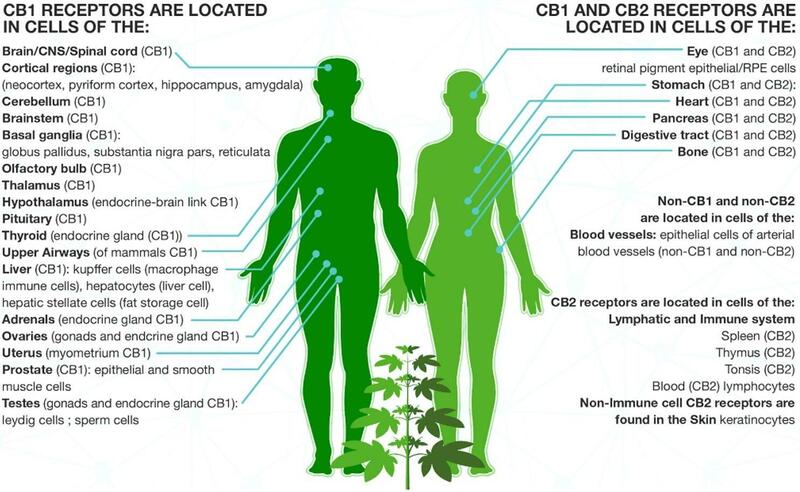 At present, there are two known types of cannabinoid receptors, termed CB1 and CB2, with mounting evidence of more. The human brain has more cannabinoid receptors than any other G protein-coupled receptor (GPCR) type. We operate at peak levels when we feel normal and properly balanced. Being sick or unsettled (at any level of being: mind, body, emotions, etc.) is unnatural. Our most normal and natural state of being is strength, health and happiness.